Some plants seem to change their name more than others. We first purchased this species in the 1990’s as Pleurothallis tubata before changing it to Physosiphon tubatus to reflect changes in Pleurothallis, before changing it back to Pleurothallis tubata, then changing it to Stelis tubata and recently we have changed it again to Stelis emarginata. What ever its name it is a fantastic small growing orchid that does well in pots, mounted or in baskets, producing masses of small orange or yellow flowers that cover the plant. The leaves are stiff and rather spoon shaped, lasting many years and producing fresh flower spikes when ever the plant comes into bloom. 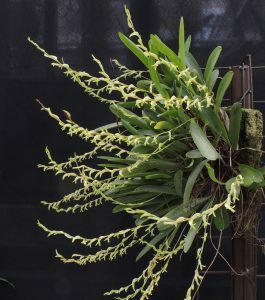 Stelis seems to fit it well but it is a tougher plant that many of the Stelis species we grow so a great addition to any collection. We grow it in Cool Americas where the orange clone flowers in April and this yellow clone flowers in the summer. It is native to central America and is found from 1800 to 3500m altitude indicating that it could grow cooler than we grow it.